Wednesday's session started out on rough footing compliments of a reduction in 2015 growth forecasts by the World Bank. However, the Fed's Beige Book shed a more positive light on the U.S. economy. Despite global woes, the domestic climate is overall positive. According to the Beige Book, the Fed sees the economy expanding at a modest, to moderate, pace in most of its 12 districts. Nonetheless, there were some concerns regarding the impact of the decline in oil prices (lower drilling activity affects employment and capital expenditures). Today was option expiration for February crude oil; it isn't uncommon to see sudden price spikes going into the pit close on expiration day, and that is exactly what we saw in afternoon trade. The massive short squeeze in oil helped to drag the stock indices higher, and eventually lead Treasuries lower. Could this be the beginning of something bigger? We think so. 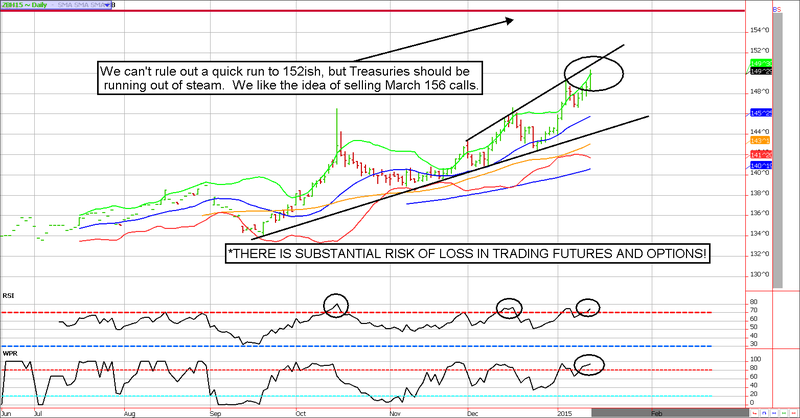 Our Treasury market analysis was featured on CNBC's Mad Money with Jim Cramer last night! The mid-1980s offered sharp technical support in the form of the multi-month up-trend line. Despite looking rather ugly this morning, the e-mini S&P 500 managed to forge a rally from session lows. We'll know more in the coming days, but there are quite a few things lining up that point toward reversals in the financial markets. In other words, we could be in store for the dollar to finally reverse, Treasuries to fall back to more sustainable levels, stocks to resume the up-trend, and commodities (particularly crude oil) to find footing. This afternoon's realization by investors that things aren't "that bad" was influenced by the Fed's Beige Book and a crude oil rally, but it will be up to the rest of this week's economic data to keep things moving in the desired direction. **Consensus:** Assuming we don't get an fresh concerns in China or Europe overnight, it is likely we've seen the low of this move. 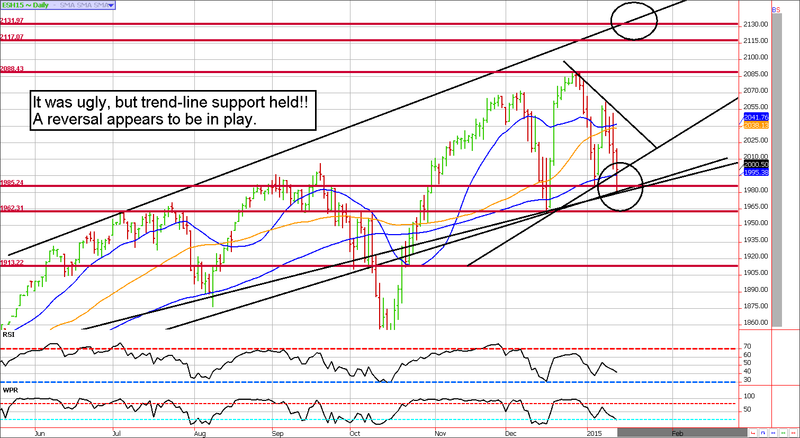 1985 support held well, we'll need to see a run to 2040ish to confirm a resumption of the bull. December 9 - Buyback the crude oil $75 calls to lock in a profit on that side of the trade. We'll hold the short $61 puts in hopes of a rebound in oil. December 10 - Buy back the crude oil 61 puts and sell 58/66 strangles for February. December 12 - Buy back the February crude oil 66/58 strangles and sell the 64/53 strangles. December 30 - Buy back the February crude oil 62.50 calls (part of strangle) to lock in a gain (about $720 before transaction costs for most). January 5 - Buy back the March crude oil $68 call near 25 cents to lock in a gain on that side of the trade (about $600 before transaction costs for most). January 6 - Buy back existing March crude 44 put and February 49 put, replace them with short March 40 puts and 58 calls (one for one).